Research suggests a nutrient-rich diet plus exercise may prevent and even reverse it. Insulin resistance is a state of reduced cellular responsiveness to normal circulating concentrations of insulin in the blood. Much is unknown about the condition’s etiology, but research has shown insulin resistance appears to play a role in the pathophysiology of prediabetes, type 2 diabetes, and cardiovascular disease (CVD). While much remains to be discovered about the exact causes of the condition, research has investigated and pinpointed several likely risk factors, including a sedentary lifestyle, central obesity, genetics and, most likely, diet. 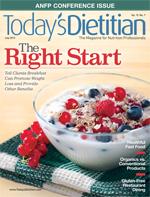 To support dietitians in helping clients and patients address and possibly even reverse insulin resistance, this continuing education article reviews the current theory and research regarding the condition’s etiology and major risk factors as well as the role it may play in the development of type 2 diabetes and CVD. In the book How Fat Works, author Philip A. Wood defines insulin resistance as a condition in which the body’s cells require more and more insulin to achieve normal levels of glucose uptake.5 According to Wood, a professor of genetics, nutrition science, physiology, and biophysics as well as an experimental pathologist and director of genomics at the University of Alabama at Birmingham, insulin resistance typically develops over many years and eventually can lead to overt diabetes when the pancreas no longer can keep up with a chronically excessive insulin demand. Excess quantities of circulating fatty acids commonly are associated with obesity, insulin resistance, and type 2 diabetes.6 According to Wood, an overabundance of fatty acids also may result in the abnormal deposition of fat in both liver and muscle tissues.5 Indeed, studies have shown a strong positive relationship between the accumulation of fat in muscle tissue and insulin resistance.7 In addition, a positive relationship has been observed between fasting plasma fatty acid concentrations and insulin resistance in muscle.8 In other words, insulin resistance in muscle diminishes as circulating fatty acids are reduced. • Insulin binds with an insulin receptor on the cell membrane, which activates a protein known as insulin receptor substrate molecule 1 (IRS-1). • IRS-1 activates the enzyme phosphatidylinositol-3 (PI-3) kinase. • PI-3 activates a cascade of reactions that ultimately stimulate the translocation of glucose transporter 4 (GLUT4) to the cellular membrane. • GLUT 4 allows the movement of glucose across the membrane and into the cell. Once insulin resistance begins, it appears to stimulate a series of events that continue to increase levels of both glucose and insulin in the blood. Under normal circumstances, circulating levels of insulin rise after a meal and reduce gluconeogenesis (the production of glucose from noncarbohydrate substrates) in the liver. The risk factors for insulin resistance include central obesity, physical inactivity, and genetics. Many people who are insulin resistant are obese (though some who are lean also can suffer from insulin resistance), but not all obese individuals are insulin resistant.18 Gerald Reaven, MD, an endocrinologist and professor emeritus of medicine at Stanford University who’s considered an expert on insulin resistance, maintains that insulin’s ability to stimulate cellular glucose uptake may vary more than sixfold among individuals.19 In fact, Reaven and his colleagues estimate that only 25% to 35% of this variability in insulin action is related to being overweight.20 Therefore, obesity is likely only one of several factors that modulate insulin action. In research that was part of the Tufts Twin Study, Elder and colleagues attempted to determine the genetic heritability of components of the metabolic syndrome, which includes insulin resistance.23 Heritability is defined as the relative influence of genetic factors on the expression of a disease or disease trait. Elder and colleagues connected every component of the metabolic syndrome, including insulin resistance, with a genetic link and determined that genetics had more of an influence on the development of the metabolic syndrome than did environmental influences. The study’s results suggest that, despite established relationships between environmental factors and the metabolic syndrome, genetic variation may be an important and possibly primary determinant of the expression of insulin resistance. In the KANWU study, a three-month controlled, parallel, multicenter study performed at five different centers: Kuopio, Finland; Aarhus, Denmark; Naples, Italy; Wollongong, Australia; and Uppsala, Sweden, 162 subjects from these countries received isocaloric diets that differed only in fat quality, not quantity.25 Researchers found that insulin sensitivity was impaired in individuals on the higher saturated fat diet and improved in those on the higher monounsaturated fat diet. However, substituting monounsaturated fat for saturated fat improved insulin sensitivity only if total fat intake remained at no more than 37% of calories. The authors concluded that the type of fat in the diet impacted insulin resistance, but quantity of fat also was important. In the SLIM study (Lifestyle Intervention on Postprandial Glucose Metabolism), researchers also demonstrated improved glucose tolerance and insulin sensitivity among participants who reduced their intake of both saturated fat and total fat.27 Again, the benefits of reduced saturated fat intake were noted only in those with a total fat intake of less than 35% of calories. All these studies suggest that a diet low in saturated fat but also moderate in total fat content improves insulin sensitivity. For example, elevated levels of insulin resulting from insulin resistance stimulate the liver to increase its production of triglyceride-rich very-low-density lipoproteins, thus causing blood triglyceride levels to rise.28,30 Insulin-resistant adipose tissue undergoes lipolysis in the fed and fasting state, also adding to the plasma triglyceride load.5,28 Insulin resistance may reduce the body’s ability to clear fat from the blood after a meal.28 As Reaven’s research demonstrates, all these factors contribute to the development of CVD and an increased risk of heart attack. Research shows that weight loss and physical activity can play an important role in improving insulin resistance. In this study, diets were designed on an individual basis to facilitate a weekly 0.5-kg weight loss. At the end of eight weeks, both groups lost an average of 7% of their initial body weight and demonstrated similar reductions in both waist circumference and percent body fat. Both groups experienced comparable improvements in insulin sensitivity, and researchers attributed this improvement to weight loss alone, not to the specific macronutrient makeup of the diets. Because this study implies that dietary fat levels may not be as important as weight loss for reducing insulin resistance, it’s evident that questions remain regarding the relative contributions of macronutrients and weight loss to the reversal of insulin resistance. There’s substantial literature showing improved insulin sensitivity after exercise, both with and independent of weight loss.41-47 There’s debate about the best exercise prescription to maximize insulin sensitivity in different populations, but both regular aerobic exercise and resistance training seem to confer beneficial results. The exercise intervention in this study was a simple walking program, although participants were gradually (at the end of four weeks) exercising at a relatively high level of intensity (80% to 85% of maximum heart rate) for 50 to 60 minutes per day, five days per week. Level of fitness, as measured by aerobic capacity, was strongly correlated with insulin sensitivity in this study group. With results similar to those of Barnard, these researchers also discovered a nominal improvement in insulin sensitivity in the vegan diet group. However, the vegan group demonstrated significantly improved pancreatic beta-cell function and a reduction in intramuscular fat deposits, both indirect indicators of improved glycemic control and insulin sensitivity. Resistance exercise to build muscle mass can be beneficial, especially for older adults. Helping patients devise a diet and exercise program that facilitates the loss of 1 to 2 lbs of body weight per week eventually may help improve their insulin sensitivity. Saturated and trans fat seem to reduce insulin sensitivity more than poly- and monounsaturated fats, but total fat intake still needs to be controlled. A goal of 30% of calories from fat, mostly plant-based unsaturated fats, can be a reasonable and safe dietary goal for most patients with insulin resistance. Encouraging patients to follow a plant-based diet featuring vegetables, fruits, beans, whole grains, nuts, and seeds also is a sensible approach. The USDA MyPlate guidelines can be an easy first step many patients can take toward including more phytochemical-packed plants and fewer foods containing saturated fats in their meals. The USDA guidelines also suggest limiting added sugars to no more than 10% of total calories and increasing intake of carbohydrate-dense foods that are also low on the glycemic index, including unrefined grains and grain products. In general, foods that are less processed tend to rate lower on the glycemic index scale. For example, rolled oats have a lower glycemic index than instant oats. However, to more accurately assess glycemic index, it’s useful to refer to a glycemic index database, such as the one found at GlycemicIndex.com. Overall, however, current research seems to indicate that the exact macronutrient balance of the diet may be less important than sustained activity, maintaining a healthy body weight and, perhaps, the micronutrient content of the foods patients consume in preventing and treating insulin resistance. — Rita Carey Rubin, MS, RD, CDE, is a dietitian and certified diabetes educator practicing in northern Arizona. 2. Evaluate the major risk factors for developing insulin resistance. 3. Explain how central obesity and a high-fat diet may influence the development of insulin resistance. 4. Analyze the role insulin resistance may play in the development of type 2 diabetes and cardiovascular disease. 5. Assess the lifestyle modifications that may improve insulin sensitivity and reduce insulin resistance. 1. Which of the following may trigger insulin resistance at the cellular level? 2. Which of the following is a risk factor for insulin resistance? 3. Exercise appears to improve insulin sensitivity and reduce insulin resistance only when individuals lose weight. 4. Insulin resistance is defined as the cells’ reduced ability to respond to normal circulating levels of insulin. 5. In which of the following ways may central obesity contribute to the development of insulin resistance? 6. Exercise may reduce insulin resistance by influencing how well cells use which of the following for energy? 7. Insulin resistance is a major component of the metabolic syndrome. Another component of this syndrome includes which of the following? 8. Which of the following diet modifications does research suggest can reduce insulin resistance? 9. Insulin resistance can trigger the liver to produce and release glucose into the bloodstream in the fed state. 10. Insulin resistance ultimately can lead to the development of type 2 diabetes because the body eventually does which of the following? 1. Yalow RS, Berson SA. Plasma insulin concentrations in nondiabetic and early diabetic subjects. Determinations by a new sensitive immune-assay technique. Diabetes. 1960;4:254-260. 2. Kahn CR, Flier JS, Bar RS, et al. The syndromes of insulin resistance and acanthosis nigricans. Insulin-receptor disorders in man. N Engl J Med. 1976;294(14):739-745. 3. Olefsky J, Farquhar JW, Reaven G. Relationship between fasting plasma insulin level and resistance to insulin-mediated glucose uptake in normal and diabetic subjects. Diabetes. 1973;22(7):507-513. 4. Reaven GM. Role of insulin resistance in human disease. Diabetes. 1988;37(12):1595-1607. 5. Wood PA. How Fat Works. Cambridge, MA: Harvard University Press; 2006. 6. Brunzell JD, Ayyobi AF. Dyslipidemia in the metabolic syndrome and type 2 diabetes mellitus. Am J Med. 2003;115(Suppl 8A):24S-28S. 7. DeFronzo RA, Tripathy D. Skeletal muscle insulin resistance is the primary defect in type 2 diabetes. Diabetes Care. 2009;32(Suppl 2):S157-S163. 8. Bajaj M, Suraamornkul S, Romanelli A, et al. Effect of a sustained reduction in plasma free fatty acid concentration on intramuscular long-chain fatty acyl-CoAs and insulin action in type 2 diabetic patients. Diabetes. 2005;54(11):3148-3153. 9. Shulman GI. Cellular mechanisms of insulin resistance. J Clin Invest. 2000;106(2):171-176. 10. Boden G, Shulman GI. Free fatty acids in obesity and type 2 diabetes: defining their role in the development of insulin resistance and beta-cell dysfunction. Eur J Clin Invest. 2002;32 (Suppl 3):14-23. 11. Shulman GI. Unraveling the cellular mechanism of insulin resistance in humans: new insights from magnetic resonance spectroscopy. Physiology. 2004;19:183-190. 12. Pagel-Langenickel I, Bao J, Pang L, Sack MN. The role of mitochondria in the pathophysiology of skeletal muscle insulin resistance. Endocr Rev. 2010;31(1):25-51. 13. Sandeep S, Gokulakrishnan K, Velmurugan K, Deepa M, Mohan V. Visceral and subcutaneous abdominal fat in relation to insulin resistance and metabolic syndrome non-diabetic south Indians. Indian J Med Res. 2010;131:629-635. 14. Lord J, Thomas R, Fox B, Acharya U, Wilkin T. The central issue? Visceral fat mass is a good marker of insulin resistance and metabolic disturbance in women with polycystic ovary syndrome. BJOG. 2006;113(10):1203-1209. 15. Preis SR, Massaro JM, Robins SJ, et al. Abdominal subcutaneous and visceral adipose tissue and insulin resistance in the Framingham Heart Study. Obesity. 2010;18(11):2191-2198. 16. Kershaw EE, Flier JS. Adipose tissue as an endocrine organ. J Clin Endocrinol Metab. 2004;89(6):2548-2556. 17. Fernandez-Real JM, Ricart W. Insulin resistance and chronic cardiovascular inflammatory syndrome. Endocr Rev. 2003;24(3):278-301. 18. McLaughlin T, Allison G, Abbasi F, Lamendola C, Reaven G. Prevalence of insulin resistance and associated cardiovascular disease risk factors among normal weight, overweight, and obese individuals. Metabolism. 2004;53(4):495-499. 19. Reaven GM, Abbasi F, McLaughlin T. Obesity, insulin resistance and cardiovascular disease. Recent Prog Horm Res. 2004;59:207-223. 20. Abbasi F, Brown BW Jr, Lamendola C, McLaughlin T, Reaven GM. Relationship between obesity, insulin resistance, and coronary heart disease risk. J Am Coll Cardiol. 2002;40(5):937-943. 21. Bogardus C, Lillioja S, Mott DM, Hollenbeck C, Reaven GM. Relationship between degree of obesity and in vivo insulin action in man. Am J Physiol. 1985;248(3 Pt 1):E286-E291. 22. Risérus U, Arnlöv J, Berglund L. Long-term predictors of insulin resistance: role of lifestyle and metabolic factors in middle-aged men. Diabetes Care. 2007;30(11):2928-2933. 23. Elder SJ, Lichtenstein AH, Pittas AG, et al. Genetic and environmental influences on factors associated with cardiovascular disease and the metabolic syndrome. J Lipid Res. 2009;50(9):1917-1926. 24. Borkman M, Storlien LH, Pan DA, Jenkins AB, Chisholm DJ, Campbell LV. The relation between insulin sensitivity and the fatty-acid composition of skeletal muscle phospholipids. N Engl J Med. 1993;328(4):238-244. 26. Risérus U, Willett WC, Hu FB. Dietary fats and prevention of type 2 diabetes. Prog Lipid Res. 2009;48(1):44-51. 27. Corpeleijn E, Feskens EJ, Jansen EH, et al. Improvements in glucose tolerance and insulin sensitivity after lifestyle intervention are related to changes in serum fatty acid profile and desaturase activities: the SLIM study. Diabetologia. 2006;49(10):2392-2401. 28. Reaven GM, Strom TK, Fox B. Syndrome X: The Silent Killer: The New Heart Disease Risk. New York, NY: Simon & Schuster; 2001. 29. Grundy SM, Brewer HB Jr, Cleeman JI, Smith SC Jr, Lenfant C. Definition of metabolic syndrome: report of the National Heart, Lung and Blood Institute/American Heart Association Conference on Scientific Issues Related to Definition. Circulation. 2004;109(3):433-438. 30. DeFronzo RA. Insulin resistance, lipotoxicity, type 2 diabetes and atherosclerosis: the missing links. The Claude Bernard Lecture 2009. Diabetologia. 2010;53(7):1270-1287. 31. Hanley AJ, Williams K, Stern MP, Haffner SM. Homeostasis model assessment of insulin resistance in relation to the incidence of cardiovascular disease: the San Antonio Heart Study. Diabetes Care. 2002;25(7):1177-1184. 32. Isomaa B, Almgren P, Tuomi T, et al. Cardiovascular morbidity and mortality associated with the metabolic syndrome. Diabetes Care. 2001;24(4):683-689. 33. What are the symptoms of insulin resistance and prediabetes? National Diabetes Information Clearinghouse website. http://diabetes.niddk.nih.gov/dm/pubs/insulinresistance/ - relate. Last updated January 22, 2013. Accessed May 7, 2013. 34. American Diabetes Association. Standards of Medical Care in Diabetes 2013. Diabetes Care. 2013;36(S1):S11-S66. 35. Lorenzo C, Wagenknecht LE, D’Agostino RB Jr, Reuers MI, Karter AJ, Haffner SM. Insulin resistance, beta cell dysfunction, and conversion to type 2 diabetes in a multiethnic population. The Insulin Resistance Atherosclerosis Study. Diabetes Care. 2010;33(1):67-72. 36. Kitabchi AE, Temprosa M, Knowler WC, et al. Role of insulin secretion and sensitivity in the evolution of type 2 diabetes in the Diabetes Prevention Program: effects of lifestyle intervention and metformin. Diabetes. 2005;54(8):2404-2414. 37. Unger RH, Grundy S. Hyperglycaemia as an inducer as well as a consequence of impaired islet cell function and insulin resistance: implications for the management of diabetes. Diabetologia. 1985;28(3):119-121. 38. Poitout V, Robertson RP. Glucolipotoxicity: fuel excess and ß-cell dysfunction. Endocr Rev. 2008;29(3):351-366. 39. Uusitapa M, Lindi L, Louheranta A, Salopuro T, Lindstrom J, Tuomilehto J. Long-term improvement in insulin sensitivity by changing lifestyles of people with impaired glucose tolerance: 4-year results from the Finnish Diabetes Prevention Study. Diabetes. 2003;52(10):2532-2538. 40. Bradley U, Spence M, Courtney CH, et al. Low-fat versus low-carbohydrate weight reduction diets: effects on weight loss, insulin resistance and cardiovascular risk: a randomized control trial. Diabetes. 2009;58(12):2741-2748. 41. Goodpaster BH, Katsiaras A, Kelley DE. Enhanced fat oxidation through physical activity is associated with improvements in insulin sensitivity in obesity. Diabetes. 2003;52(9):2191-2197. 42. O’Leary VB, Marchetti CM, Krishnan RK, Stetzer BP, Gonzalez F, Kirwan JP. Exercise-induced reversal of insulin resistance in obese elderly is associated with reduced visceral fat. J Appl Physiol. 2006;100(5):1584-1589. 43. Houmard JA, Tanner CJ, Slentz, CA, Duscha BD, McCartney JS, Kraws WE. Effect of the volume and intensity of exercise training on insulin sensitivity. J Appl Physiol. 2004;96(1):101-106. 44. Houmard JA, Shaw CD, Hickey MS, Tanner CJ. Effect of short-term exercise training on insulin-stimulated PI-3 kinase activity in human skeletal muscle. Am J Physiol. 1999;277(6 Pt 1):E1055-E1060. 45. Kelley DE, Goodpaster B, Wing RR, Simoneau JA. Skeletal muscle fatty acid metabolism in association with insulin resistance, obesity, and weight loss. Am J Physiol. 1999;277(6 Pt 1):E1130-E1141. 46. Hasson RE, Granados K, Chipkin S, Freedson PS, Braun B. Effects of a single exercise bout on insulin sensitivity in black and white individuals. J Clin Endocrinol Metab. 2010;95(10):E219-E223. 47. Yassine HN, Marchetti CM, Krishnan RK, Vrobel TR, Gonzalez F, Kirwan JP. Effects of exercise and caloric restriction on insulin resistance and cardiometabolic risk factors in older obese adults. A randomized clinical trial. J Gerontol A Biol Sci Med Sci. 2009;64(1):90-95. 48. Chaston TB, Dixon JB, O’Brien PE. Changes in fat-free mass during significant weight loss: a systematic review. Int J Obes (Lond). 2007;31(5):743-750. 49. Newman AB, Lee JS, Visser M, et al. Weight change and the conservation of lean mass in old age: the Health, Aging and Body Composition Study. Am J Clin Nutr. 2005;82(4):872-878. 50. Willey KA, Singh MA. Battling insulin resistance in elderly obese people with type 2 diabetes: bring on the heavy weights. Diabetes Care. 2003;26(5):1580-1588. 51. Ferrara CM, Goldberg AP, Ortmeyer HK, Ryan AS. Effects of aerobic and resistive exercise training on glucose disposal and skeletal muscle metabolism in older men. J Gerontol A Biol Sci Med Sci. 2006;61(5):480-487. 52. Barnard ND, Scialli AR, Turner-McGrievy G, Lanou AJ, Glass J. The effects of a low-fat, plant-based dietary intervention on body weight, metabolism, and insulin sensitivity. Am J Med. 2005;118(9):991-997. 53. Goff LM, Bell JD, So PW, Dornhorst A, Frost GS. Veganism and its relationship with insulin resistance and intramyocellular lipid. Eur J Clin Nutr. 2005;59(2):291-298. 54. Kirwan JP, Barkoukis H, Brooks LM, Marchetti CM, Stetzer BP, Gonzalez F. Exercise training and dietary glycemic load may have synergistic effects on insulin resistance in older obese adults. Ann Nutr Metab. 2009;55(4):326-333. 55. Minich DM, Bland JS. Dietary management of the metabolic syndrome beyond macronutrients. Nutr Rev. 2008;66(8):429-444.